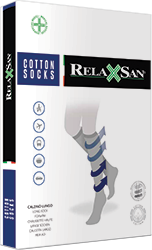 Cotton and Silver fiber Mens knee sock with graduated compression. Silver fiber at skin contact provides an antibacterial function, and soft and comfortable knee elastic hem. Anatomical and reinforced heel and toe for maximum comfort, proper fit and long durability. Two compression degrees available, 20-25 mmHg (medium) and 20-30 mmHg (strong). Art. 830 – 20-25 mmHg* Compression recommended for the therapy of the light chronic venous insufficiency, varicose veins and swelling. Art. 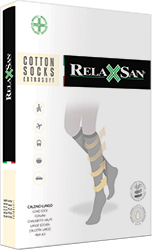 930 – 20-30 mmHg* Compression recommended for the therapy of the venous insufficiency, varicose veins, oedema. Phlebitis, after surgeries and in the prevention of the Thrombosis. For allergic problem. Safe, non-toxic. Does not contain any chemical products or residues of pesticides. 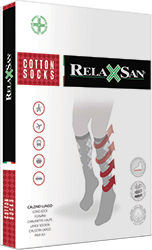 Fights bacteria which cause odours and eliminate fungus, responsible for the Athlete’s foot. Thanks to its thermal conductivity. Based on its high capacity of electric conduction. Neutralize ammonia and denatured proteins – two principal causes of odour.